During the 100th anniversary of Finnish animation, a wide selection of contemporary non-commercial animation will be screened in 3 week screening sequences. A playful and interactive exhibition on experimental sound art, where you can play music on the iPad App iOS sound and music application produced collectively by Hai Art. The visitor may take a stroll in an ear canal, test out neuro modulator and listen to sounds of the museum in a vintage phone booth. Flowers and plants were popular motifs in art already in the classical period. Bringing flowers as a present is an ancient tradition; flowers can express love, apology, or congratulation for an achievement. Flowers have their own refined language that, in our times, has been almost forgotten. In fine art, flower paintings emerged as a genre in the late 16th Century, and The Netherlands became the centre of the flower and still life style in the 17th Century. Artists would specialize in different motifs, and flower and fruit painters were the most well-known ones. The still lives were often very symbolic and reminded the viewer of the transience of life. An exhibition of works designed to be experienced with the whole body, through the sense of touch. Perfect for special groups as well as everyone interested in multisensory and experiential art. Liikkeellinen improvisaatio Kehona-näyttelyyn. | Kinetic improvisation to Body Sensing exhibition. Photographer Chi Modu has captured the biggest icons of the hip hop movement, including Tupac Shakur, The Notorious B.I.G., Mary J. Blige, and LL Cool J during the 1990´s when many of them were not yet famous. 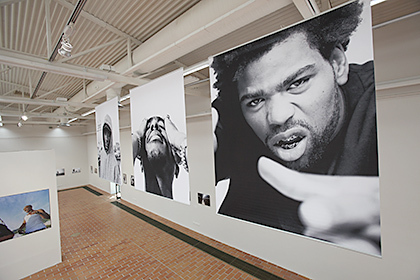 Chi Modu has not only chronicled the most important phase of the hip hop movement, he has also managed to show the artists as real people, rather than one-dimensional celebrities. The film is focusing on the recently concluded trial of François Bazaramba, a Rwandan citizen who sought asylum in Finland in 2003, where he was convicted nine years later for his role in the 1994 Rwandan genocide. 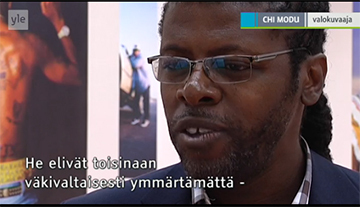 In a bizarre geographical inversion, the Finnish trial took place from 2009 to 2010 in improvised courts in Rwanda and Tanzania, with the legal proceedings transmitted to and from Bazaramba’s Helsinki prison cell via Skype and other videoconferencing technologies. Artist duo Simka connects young people with established art in the creation of a work of art for the Pori Art Museum as well to the Cultural Capitals Umeå and Riga. Key components of the project is the exchange of experiences and expectations along with following up and to work together within an artistic process. The trees are processed and sculpted in workshop format led by the artists. After the workshop the artwork will be launched outside the art museum, where they form a large floating grove of trees. Floating living trees located on lifebuoys out on the water. The installation is centrally located in each of the three cities. It gives an organic impression that evokes thoughts of man, the water and the trees strength, value, earlier as now, here joined in an unexpected way. The natural elements challenge with and against each other. Lifebuoys (frälsarkransarna sv./ eng. salvationrings) are associated with humans and the maritime dimension in travel and escape. Baltic Sea - Floating Trunks wants with the cooperation around the artwork to unite local forces - the trees, the water and the residents in a larger perspective of the Baltic Sea and its cultural community. Seeing the Baltic Sea as a common elastic, floating continent. That both unites and divides. When the trees are brought up on land after the summer, they’ll be placed into a citypark to take root. This provides a long term aspect of the artwork: offering the co-creators an obvious place and part of the city. Baltic Sea- Floating Trunks becomes with its location a link between the river and the sea which leads on to an international context. Moreover, a final seminar and an anthology of the project gives opportunity to gather and develop the collected experience for future communications. Konstnärsduon SIMKA skapar möten mellan unga människor och den etablerade konsten i framtagningen av ett konstverk för Pori Art Museum i Björneborg samt till Kulturhuvudstäderna Umeå och Riga. Centrala delar av projektet är utbyte av erfarenheter och förväntningar, jämte att följa upp och arbeta med det i en konstnärlig process. Träden kommer att bearbetas och skulpteras på i workshop-form ledda av konstnärerna. Efter workshopen sjösätts verket där de bildar en större flytande dunge. Flytande levande träd placerade på livbojar på vattnet vid museet. Verket står centralt placerat i var och en av de tre städerna. Det utgör ett organiskt blickfång som väcker tankar om människans, vattnets och trädens styrka, värde, då som nu, här förenade på ett oväntat sätt. Elementen för en kamp med och mot varandra. Livbojarna eller frälsarkransarna ger en association till människan och den marina dimensionen i resandet och flykten. Baltic Sea – Floating Trunks vill i samarbetet kring konstverket förena lokala krafter– träden, vattnet och invånarna i ett större perspektiv över Östersjön och dess kulturella gemenskap. Att se på Östersjön som en gemensam elastisk, flytande kontinent. Som både förenar och skiljer. När träden efter sommaren bärgas, placeras de ut i stadens grönområde för att rota sig. Detta ger en långsiktig aspekt av konstverket: medskaparnas självklara plats i stadsrummet. Baltic Sea –Floating trunks blir med sin placering en länk mellan älven och havet som leder vidare i ett internationell sammanhang. Dessutom bidrar ett avslutande seminarium och en antologi över projektet till möjlighet att samla och utveckla erfarenheterna för framtida kommunikation. T.E.H.D.A.S. artists devote their attention to mystical, metaphysical and dreamy ambiences and imaginary motifs. The works from the collections of Pori Art Museum and Satakunta Museum form part of a constantly morphing installation in which performance art, digital culture, and organic nature melt into one. In co-operation with: City of Pori Technical Department / Public Parks. Eero Markuksela approaches the conceptual imagery of the ancient Chinese art and culture tradition with the means of photography, writing, and painting. The old Chinese artworks in the exhibition belong to the collections of Onni Okkonen and Liisa and Otto Kotovuori. 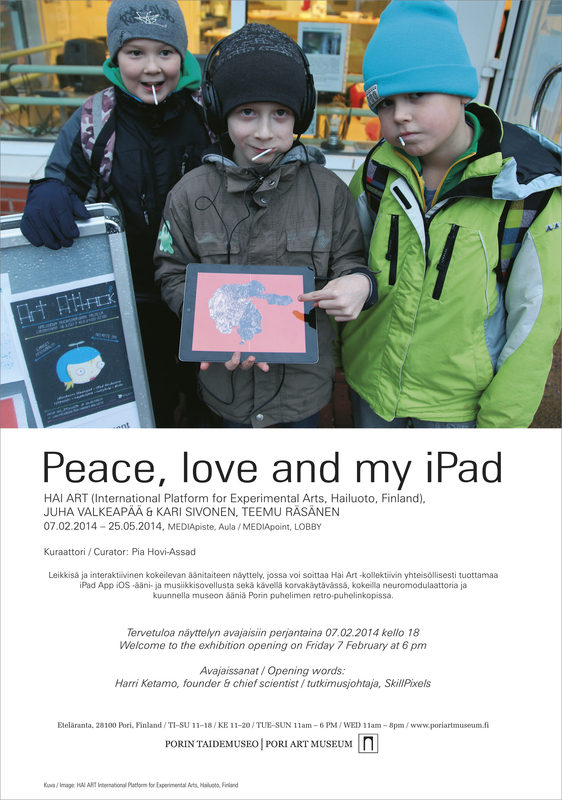 In co-operation with: Joensuu Art Museum. Brush, Push, Prod is an exhibition about the different levels and dimensions of touching. The works featured in the exhibition give tangible expression to the different levels of touching. 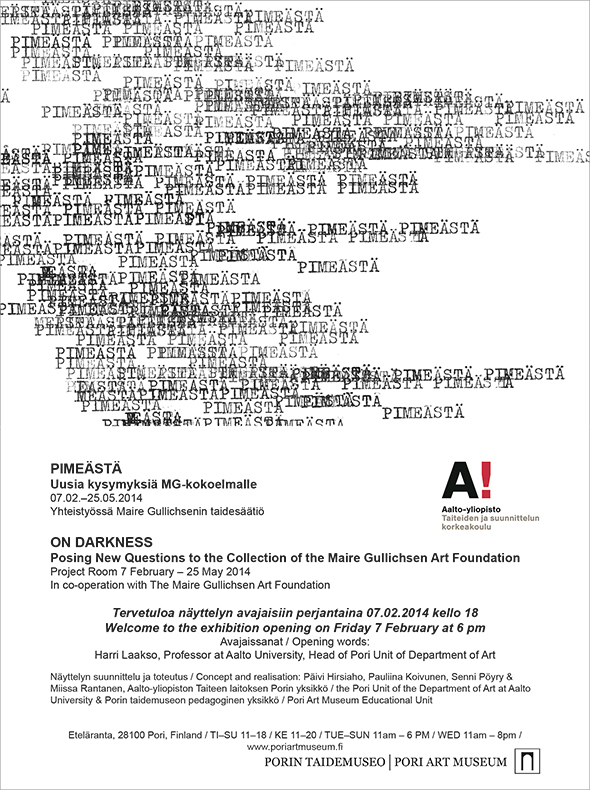 The exhibition is a continuation of the Body Sensing show of touchable art presented by the Pori Centre for Children’s Culture at the Pori Art Museum in summer 2014. The Kaiho Series” by Argentian/Australian artist Pilar Mata Dupont is a video based triptych relating to the concept of the ’kaiho’. exhibition consists of photographs and videos of these projects. In co-operation with: Porin Videotuki. A new video art work by Johanna Lecklin, which is based on a participatory video project that spans several years.